Fan interest in the controversial spot crashed the brand's site. 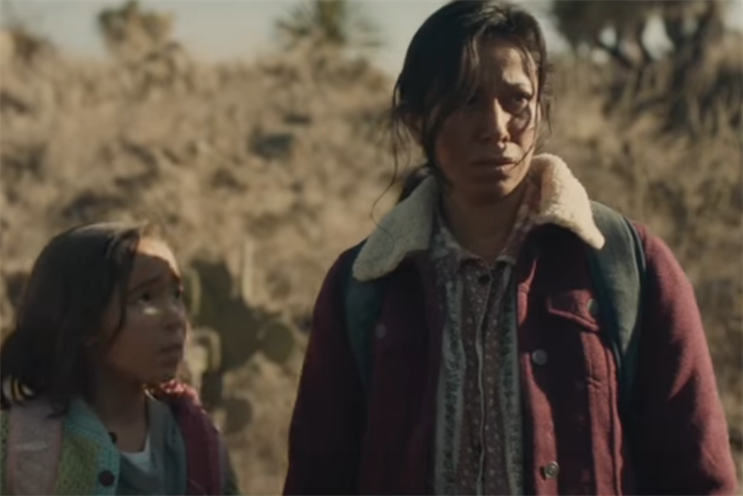 Viewers eager to see the conclusion of Super Bowl newcomer 84 Lumber’s cinematic spot were stymied by, well, everyone else who wanted to see the rest of the ad, too. The end of the 90-second spot directed viewers to a web address to see the rest of the nearly 6-minute short film. But 300,000 people tried to load the site in the first minute, twice what the server was able to handle. Instead, for about 10 minutes, users received a "service unavailable" error. Now the site is back up, and the full video has been posted to the more reliable YouTube. There’s also a version that picks up where the Super Bowl spot left off, in case you just can’t bear to sit through the first minute and a half again. But watch the whole thing from the beginning, because it tells more of the story. The full-length film begins with the mother and daughter making a sad farewell to an old man. They journey—in the back of a pickup truck, fording rivers, riding the rails and on foot across harsh terrain. All the while, the daughter continues to collect scraps along the way. By the end, the film becomes heavily allegorical. The presence of an actual wall in the desert, tall and sturdy enough even for our new president, drives home that this isn’t a documentary. This family is a representation of all migrants seeking a better life in this country. That their salvation is made of wood—84 Lumber is selling a product, after all—seems a purposeful nod to the brand’s intent. Whether the millions of dollars required to run this beautiful and emotional movie in front of a politically divided audience pays off remains to be seen.